*** author’s note*** Each year, I compose two stories to be submitted to Visible Ink, a writing program through Memorial Sloan Kettering. The stories are published in an annual anthology consisting of other stories as told by other cancer patients and survivors from MSKCC. Each other in general gets one story published per year. I will post the other story when the book is published, but for now, here is the story that was 2nd place for me. Emotional support comes in all forms when faced with a serious illness like cancer. When it comes to humans, that support has its flaws. People can be moody. Some can be “two-faced”. Co-workers often express jealousy as if the cancer patient is receiving favors for their battle with life. Family members may find themselves distancing from their loved one. Even on our worst days, when we come home from a long day, a dog more likely than not, will approach you excitedly with tail wagging, not even an accusational glare as to where you had been that entire time. And cats also, will snuggle up to you if they so choose. Shortly after I had been diagnosed with Hodgkin’s Lymphoma, besides selecting my medical care and direction, I made the decision that “pet therapy” would be a part of my cure. I lived in an apartment. Dogs were not allowed, but for a $25 fee, I could have a cat. 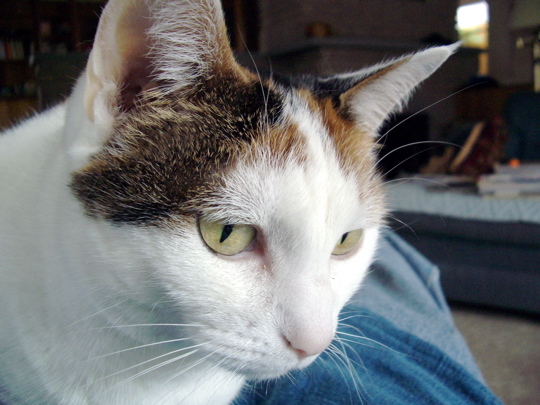 I went to the local animal shelter, adopted “Pebbles,” a white female calico. During the initial days of my diagnosis, she spent a lot of time on my lap, as I tried to gather my thoughts about the next days. But it was not until I returned from my honeymoon, that new disease had been discovered, I would have to undergo chemotherapy. My wife went with me for the first chemo appointment. It was a 25 minute ride, which ended up being a critical detail to keep in mind. This was the amount of time that I had, to get home, get up three flights of stairs, race to the toilet, when nausea would finally make its presence known. That first day, I did not make it. My wife had driven too slow. There were too many traffic lights. For the next fifteen treatments, I would be on my own. Knowing that nausea would hit me while driving, I ignored speed limit signs, accelerated at yellow traffic signals. Each appointment, I was consistent in getting to my apartment building, racing up the stairs, opening my apartment door, zoom past Pebbles, flip the seat of the toilet up, my body did the rest. After the first wretch, each time, I would glance over to the left, and there was Pebbles, just sitting in the doorway, watching me. She did not greet me as she normally would have on any other day, rubbing against my legs as I stood in the doorway. Pebbles knew my current situation was not normal. Approximately a half an hour later, after I was certain that my nausea had ended, I had definitely hoped so because I was exhausted, I stood up, closed the toilet lid, washed my hands, my face, and brushed my teeth. I crawled into my bed, and passed out. I would wake up several hours later, upon my wife entering the apartment. Each time that I awoke, I looked over to my wife’s pillow, there was Pebbles, curled up and asleep also, clearly had been watching me when I crawled up into bed. My “chemo cat”, as I often referred to her from that point on, had actually been watching over me, keeping me company until my wife had come home from work. Decades later, I would have several more pets, as I was challenged once again with severe health issues, pets were there for me every time. My biggest fear however was following heart surgery, with a freshly repaired breast bone, being greeted by my 100-pound Golden Retriever. It was not uncommon for him to stand up on his hind legs to greet me. This time, as if he sensed my fragility, simply sat right by my side, waiting for me to pet him. That is where he would stay as I recovered at home. Today it is very common to see pets in chemotherapy suites and hospitals. The emotional healing power of pet therapy has been proven to lift the spirits of people who are ill or hospitalized. In two recent hospitalizations that I experienced, I had numerous visits from furry friends. After missing my own fur friend at home, my spirits were definitely lifted. When my father went through his own battle with lung cancer, the very first day of treatment, he was greeted by a Goldendoodle, who simply rested his head on my dad’s lap. This was just one of the new changes in the atmosphere of a chemotherapy suite, which definitely has an impact on the psyche when dealing with such a difficult time period. Great story, Paul. When I had breast cancer from radiation at 48, we owned a white boxer named Chance. He was my chemo dog. He never left my side when I came home. He laid by me every minute that I rested. I finished my chemo and Chance began to cough. The cough got worse. My Jeff took him to the vet on Sunday while the kids and I were at church. When we came home, Jeff and Chance were here. Jeff brought him home to say goodbye. He had lung cancer, and it was bad. We had to take him back and put him to sleep. Later I told my PCP what had happened. I was surprised to hear him say that Chance had taken my cancer.